The HP ProLiant DL560 Gen8 (G8) offers dense high performance computing with impressive scalability and expandability in a 2U form factor. The DL560 G8 is ideal for server consolidation, virtualization, business processing, database applications and general data-intensive applications where optimization of data center space is key. The 4-socket rack server supports Intel Xeon E5-4600 v2 processors for up to 32 total cores and up to 30MB per CPU. With 48 dual in-line memory module (DIMM) slots, the DL560 G8 can scale up to 1.5TB total DDR3 memory operating at maximum speeds of 1866MHz. Hard drive options include SFF 2.5" SAS, SATA or solid state drives. With 5 hard drive bays total, the DL560 G8 supports a maximum internal storage capacity of 10TB. A total of 6 PCIe slots, 5 of which are PCe 3.0, allow for flexible and scalable I/O options so you can select the bandwidth and fabric to meet your changing business needs. Aventis Systems offers DL580 G8 servers with the P420i RAID Controller with 512MB flash-backed write cache standard. All of HP's ProLiant DL models include HP OneView 1.10 to eliminate infrastructure complexity, as well as HP iLO management Engine with embedded remote management features. 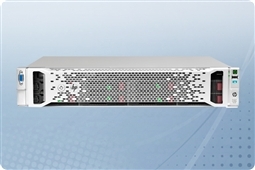 Aventis Systems carries New HP ProLiant DL560 G8 servers. All servers from Aventis System include a 3 year Comprehensive Warranty, with eligibility for optional Express warranties and onsite services. 2.5TB (5 x 500GB) 7.2K 3Gb/s SATA 2.5"
5TB (5 x 1TB) 7.2K 6Gb/s SATA 2.5"
730GB (5 x 146GB) 10K 6Gb/s SAS 2.5"
If you’re looking for a comparable Dell 4-processor model with similar specifications, please visit our R820’s. Do you need help in selecting a model, or have a question? We’re here to assist you! Please call us at 1.855.AVENTIS (283.6847) or use our Live Chat Live Chat during regular business hours. You can also email us at Sales@AventisSystems.com for a custom quote.